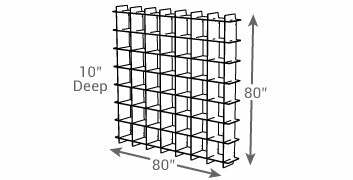 The biggest piece in our Cubby Storage line, the 49 Cubby Storage Shelf will cover most of your entire wall giving you the maximum amount of storage space in a modern, classy way. Use it with our decorative storage bins, and you can store just about anything! Even without the bins, books, electronics, stuffed animals, or clothes will fit easily. It’s amazing how much stuff accumulates with just one child. Get our 49 Cubby Storage and you will be able to keep it all neat and organized. Sprout tool-less technology also means that our 49 cubby storage is super simple to assemble. It snaps together in a flash. The joints are sturdy enough to hold a great deal of weight but they also come apart with only a little bit of effort. You can easily take it apart to move it to another room, across town, or across the country.